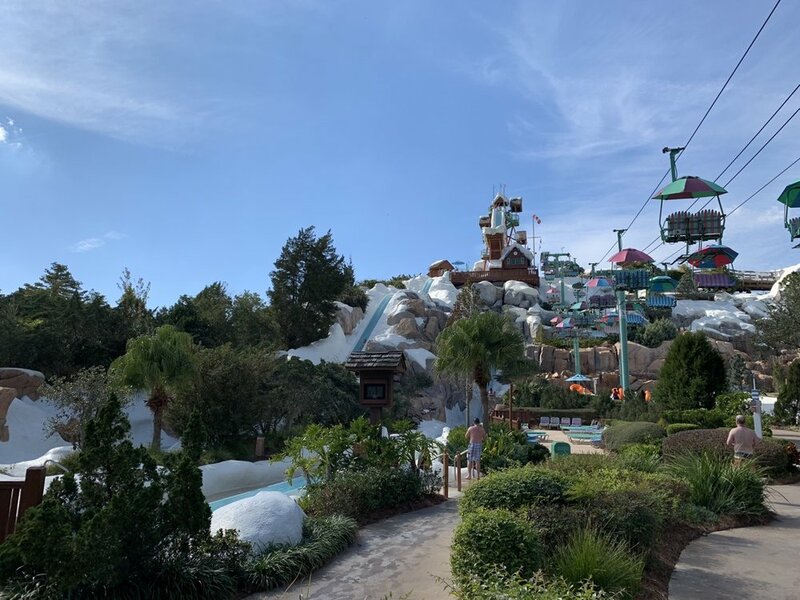 In this post, we compare the two Walt Disney World water parks, Blizzard Beach and Typhoon Lagoon. If you’re looking for more information about Typhoon Lagoon, we have a complete guide here. If you’re looking for more information about Blizzard Beach, we have a complete guide here. This is a bit of an unconventional “X vs. Y” post in that we’re going to do this analysis three ways (that’s THREE TIMES THE FUN!). First, we’re going to just lay out the major differences between the two parks. Then, we cover which water park is Best for Kids and which is Best for Adults. Finally, we do a longer “head-to-head” analysis where we award points across six different factors to crown a winner. Some of these might be a little redundant, so feel free just to read one section. But this is a post comparing two water parks, so we’re not sorry about having a bit of repetitive fun writing it. So at their most basic elements, these parks are the same. Basically, that just serves as a reminder that there’s no easy choice between to two. Now onto the major differences (as promised) between the two parks. These schedules are always subject to change, but roughly speaking: Blizzard Beach is the only park open from early January to mid-March. Both water parks are open mid-March to end of October. Typhoon Lagoon is the only park open from the end of October to early January. If you’re traveling outside of mid-March to October, you don’t even have to worry about choosing one of these parks, only one will be open. Blizzard Beach has a wave pool that is filled with small “bobbing” waves continuously through the day. It’s fun to bob around in (but be careful that things don’t go wrong). Typhoon Lagoon’s wave pool is that same thing—for about a third of the day. The rest of the time, the wave pool has proper “surf” waves every 90 seconds. These are huge waves that are awesome to swim with, jump into, and generally try to survive. A typical seven hour day has 5.5 hours of surf waves and 1.5 hours of bobbing waves. Also, you can have inner tubes in the Blizzard Beach wave pool, but they’re not allowed in the Typhoon Lagoon surf pool, even during “bobbing” time. You might argue that the Blizzard Beach wave pool is better for kids because of its constant bobbing waves, but kids of all sizes can enjoy the surf waves, they just have to do it appropriately close to shore. The themes of these two parks are very different. The theme of Blizzard Beach is that it’s a ski resort turned water park because of melting snow. This is sort of gimmicky—”the frozen water park! !” (small “f”)—but gimmicks work, and people love Blizzard Beach for the theme. Typhoon Lagoon is a bit more traditional, the story being that a resort town was destroyed by typhoon, giving rise to the water park. This is less gimmicky. We feel like imagineers did more with it, and you’ll see more cute details of the story throughout the park. Well, if you read a few paragraphs above, you probably aren’t surprised with this conclusion, but this is a little closer than you might think. Both of these water parks are totally great for kids, but Blizzard Beach has more specifically for kids. While you could call the kiddie play areas—Ketchakiddee and Tike’s Peak—equal, Blizzard Beach has a large area dedicated to pre-teens called Ski Patrol Training Camp. The Training Camp has a miniature ropes course, slides, a zipline, and space for swimming. Really, what does this add to your day? About 15 minutes. Typhoon Lagoon does have the “Bay Slides” for kids, which is sort of like having one element of the Training Camp in Typhoon Lagoon. All that said, Training Camp is really cool and wins the day. The Training Camp is probably a good sweet spot for kids who are looking for something with a little edge but who can’t be convinced to go down the full slides. With one big asterisk, Typhoon Lagoon is better for adults. The big asterisk is that Summit Plummet at Blizzard Beach is an awesome, thrilling experience, and obviously thats what many adults are looking for. That aside, Typhoon Lagoon has many advantages for adults over Blizzard Beach. The theming is better, making the part much more of a pleasure to wander. The main bar—Hammerhead Fred’s—is unmatched by anything at Blizzard Beach (not that it’s particularly impressive, though it has a TV). And Typhoon Lagoon is a short bus ride from Disney Springs. This makes it a perfect choice for adults, who can finish up at the water park and then continue the fun at Disney’s premier dining, drinking, and shopping area. Well, if you really just wanted to see these two parks “throw it down” in a head-to-head matchup, here we go. We’ve chosen six categories, and we’ll hand out one point for each (or 1/2 point for a tie)—water slides and rides; lazy rivers and wave pools; dry attractions; dining and drinking; theme; and nearby attractions. Keeping in mind that we haven’t had a chance to enjoy Miss Adventure Falls at Typhoon Lagoon, we’re comfortable giving this one to Blizzard Beach. By the numbers, these are equal—both have basically seven water slides. You could quibble a bit with these numbers, but seven is reasonable in each park. But quality goes to Blizzard Beach. Summit Plummet at Blizzard Beach is one of the best attractions at Walt Disney World, honestly. If you weighted ride rankings by wait times, Summit Plummet would probably be second only to PeopleMover on our resort-wide list. After that, there’s little stand out to distinguish the parks. The average quality is probably still better at Blizzard Beach, so we won’t belabor this point anymore. Point Blizzard Beach. We’re combining these into one point to maintain some consistency in weight, but also because the lazy rivers are an easy tie. They’re both good, but neither is standout. The Typhoon Lagoon surf pool is head and shoulders better than the Blizzard Beach wave pool. Both have similar “bobbing” waves, but Typhoon Lagoon also has “swells” that are big enough for surfing (though you can’t surf during park hours). Point Typhoon Lagoon. We’re combining these into one item because the dry attractions essentially are the mountains. Typhoon Lagoon’s feature mountain is Mount Mayday, with the Miss Tilly boat sitting atop, “letting off steam” every few minutes with a geyser display. Blizzard Beach’s feature mountain is Mount Gushmore, which is topped by the Summit Plummet ride, adding 30 feet to the mountain. Mount Mayday is 95 feet tall. Mount Gushmore is 90 feet, but 120 feet when you include Summit Plummet. From the point of being a park icon, we think Mount Mayday does a much better job. It’s better centered in the park, has a distinct mountain look, and has Miss Tilly. By contrast, Mount Gushmore sort of looks out of place to us. Most of what we see is the Summit Plummet structure, which—if we’re being harsh—sort of looks like what happens when you build a new tall ride in a park. Maybe it’s just not to our taste, though. Now, each mountain—and the paths up and around it—essentially serves as the dry attraction at the park, though Blizzard Beach’s Chairlift is unique. The Chairlift takes you from near the park entrance up to the top of the Green Slopes in about four minutes. Typhoon Lagoon lists Mountain Trail as an attraction. We’re fine calling it that, because we absolutely love these walking paths and exploration areas, but then to be fair we need to mention that you can take a wonderful walk up and down Blizzard Beach’s Mount Gushmore as well, it’s just not a listed attraction (unless you count it as part of the Chairlift). 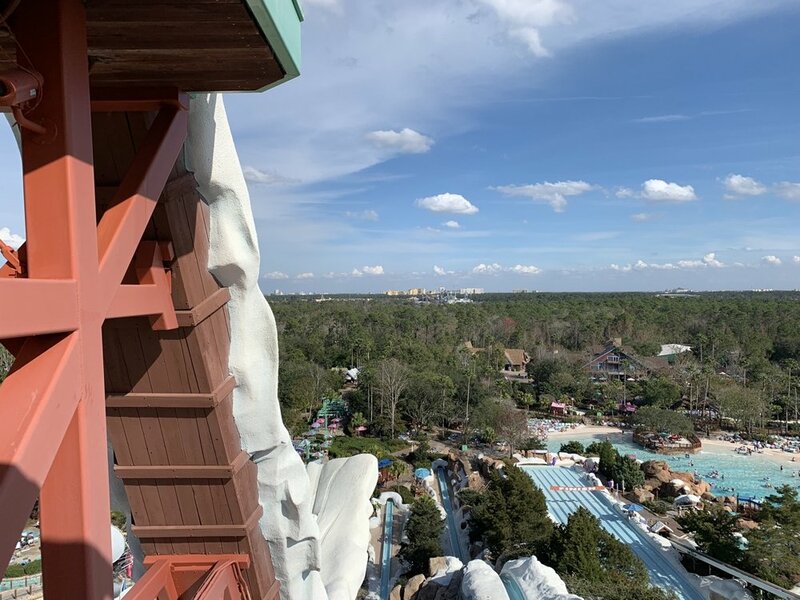 As for the experience of exploring these mountains, we’d give a slight edge to Blizzard Beach’s Mount Gushmore because of its superior views, particularly from the top of the Summit Plummet queue. Mount Mayday’s path is a real treat and probably better in itself, but it doesn’t have the same views. Mount Mayday is more iconic, Mount Gushmore is more fun to walk through, so this is our first tie. Half point to each. You’re not going to find award-winning surf and turf or mixologists at these water parks, so this one is maybe a toss-up. Both parks offer a variety of quick service options, as well as ice cream and a few small bars. On paper, Typhoon Lagoon has more dining options and a better bar. But practically, this is water park food and each park has enough to get you through the day. Neither park offers anything special, so we’ll call this one a tie (half point each). Typhoon Lagoon wins easily on this one. The Blizzard Beach theme is fine, and I guess a lot of people find the idea cool, as do we. Basically, the idea here is that a snowed area turned ski resort starts melting and turns into a water park. There might be more depth, but it isn’t evident to us. For the most part, the theme is exactly what you’d expect—you’ll see lots of fake snow (e.g. big chunky white structures) that are “melting” and producing water flow. The theming on the rides is pretty fun, as several take competitive twists from the world of snow sports, but that only carries you so far. Typhoon Lagoon, by contrast, is filled with story. The resort town that was hit by a typhoon and transformed into a water park shows its history at every turn. You’ll see details everywhere that feature not only the damage of the typhoon but the town that preceded it. Point Typhoon Lagoon. This is a weird factor to include, but hear me out. The water parks almost always close early, which means they usually won’t fill your entire day. Plus, if you’re taking Disney bus transport, you’ll probably have to change buses at the nearest major location to get to your hotel. Update: Disney is expected to have dedicated bus service between hotels and the water parks beginning March 17, 2019. Typhoon Lagoon is located very near Disney Springs, and most bus transport requires a transfer there. This means that Typhoon Lagoon is really well-positioned for a night out at Disney Springs. Blizzard Beach is located near Animal Kingdom, and most bus transport requires a transfer there. Obviously this has ups and downs. You need a park ticket to take advantage of this, and you’ll probably want to book a FastPass+ or two to make any use of the short time in the park (though we’re fine skipping rides at Animal Kingdom, personally). Blizzard Beach also is right next to a Disney miniature golf course—Winter Summerland. Now, this will also require a separate purchase, but it doesn’t require any transit (if you drive and don’t have to go to Animal Kingdom anyways, that is) or advance planning. After all that, we’ll call this a tie, but we’re happy to have given you something to think about. Personally, we favor Typhoon Lagoon, but Disney Springs isn’t for everyone, and vacationing families in particular may appreciate mini-golf or a quick stop by Animal Kingdom on their way back to the resort. Typhoon Lagoon comes out on top, but how much weight should you really put in this? Obviously if you actually read this entire post, you know how close these two parks are in quality. Three of our six categories came out as ties, and that’s because you really have to get down to the nitty gritty to divide them, and even then they’d come out pretty even. In our mind, the decisive factor in this analysis was theme. Theme! We appreciate theme, but we’re guessing 90% of readers are going to think both are equally great in theme. The point is, don’t let this final score make the decision for you. Figure out what points are important to you, and decide based on those. When it comes time to book, we've got you covered with posts on how to book cheap flights, how to get the best deal on your Disney hotel, and where to find discount Disney World tickets. And of course everyone wants to know whether or not they should get a dining plan—check out our Complete Guide to Disney World Dining Plans! How do you choose between Typhoon Lagoon and Blizzard Beach?